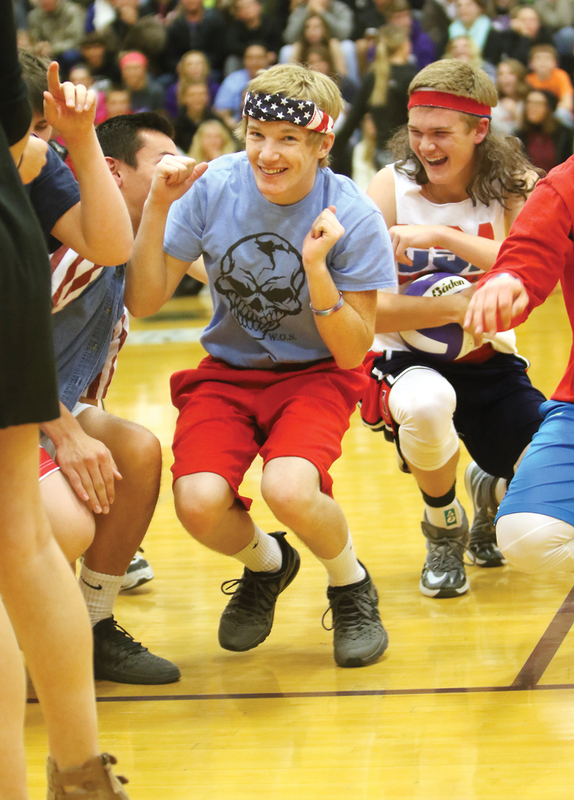 Paxton Sternberg, Vance Janssen and Team USA do a victory dance following win over the Volleybrawlers. 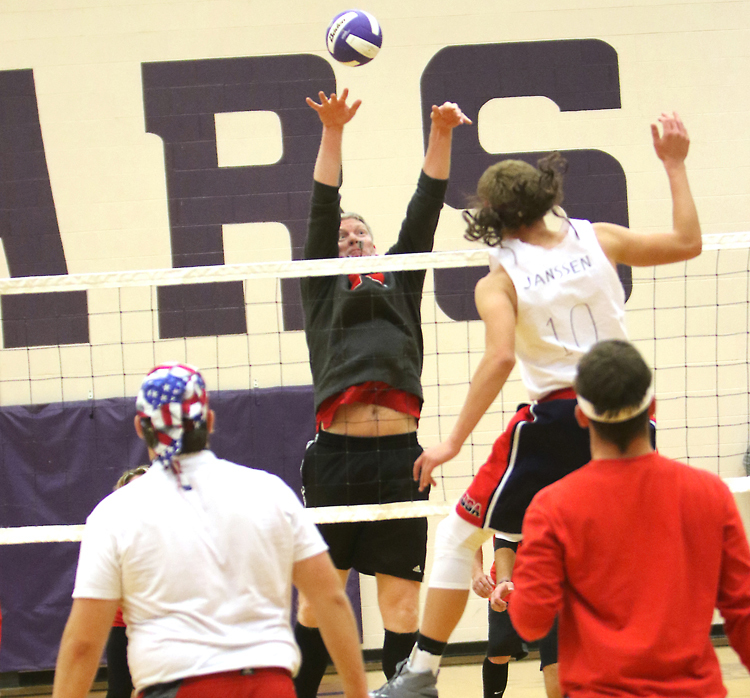 Blair High School National Honor Society sponsored the Macho Man volleyball tournament last week to raise cash donations for the Washington County Food Pantry. A district wide food drive is underway as well. The NHS collected $1300 from spectators at the event. Team USA won the 4 all-male school team tourney and then defended their title against a celebrity all-star team from the community. 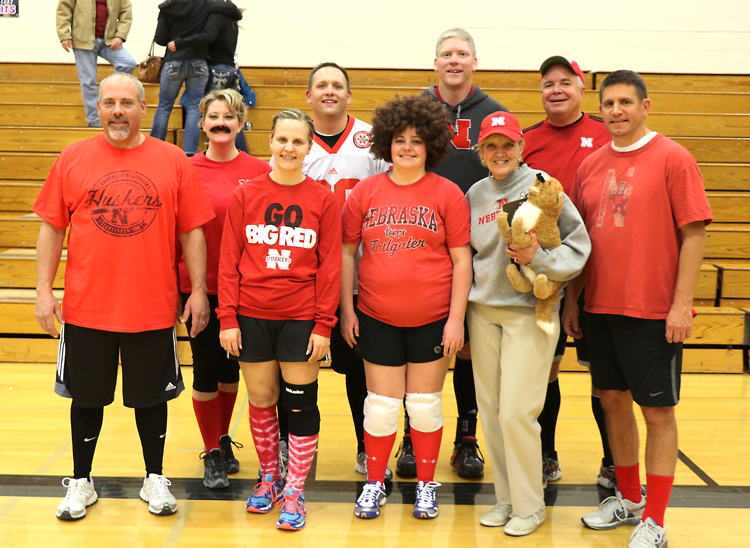 The Husker Wannabes team featured Lincoln Tilson from Sid Dillon, Mindy Rump from Washington Street Pre-school, Rii=chelle Johannes from Two Rivers Bank, Chris Rhoades from EnterprisePublishing, Sarah Tinkham from Great Plains Communications, Jayu Frazer from Cargill, Rick Paulsen from MACC, and Dave Ladwig from Washington County Bank. Blair Area Chamber of Commerce director Harriet Wait took actd as coach. Jay Frazer goes up against Team USA player Vance Janssen. left to right – Lincoln Tilson from Sid Dillons, Mindy Rump from Washington Street Pre-School Richelle Johannes from Two Rivers Bank, Chris Rhoades from Enterprise, Sarah Tinkham from Great Plains Communications, Jay Frazer from Cargill, Harriet Waite from Blair Chamber of Commerce, Rick Paulsen from MACC, Dave Ladwig from Washington County Bank. Sean Ward and Sean Petersen go up to defend Luke Vopnford’s volley. Nebraska Wannabee Coach Harriet Waite Pelinni jogs onto the court. Coach Harriett Waite motivates her team. Rick Paulsen returns the ball.